I'm not sure when I first heard of Letterboxing but I joined Atlas Quest on 02 Mar 2014 and logged my first find on 22 Mar 2014. So my activity is less than a year old. My first experience was with Manned Space Programs of the U.S.A. from 1959 to 2011 (AQ233506) while searching for a geocache. I found a few more related to the space program and a few during our trip north in the spring. But that is the extent of my letterboxing experience. I found this weekend's event (AQ3195 -- "Love Those Movies!") on Atlas Quest. 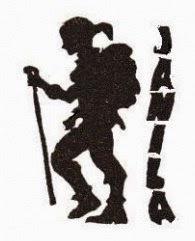 Michelle and I decided it was time for a new adventure so we signed up. Today we travelled the 85 miles from Titusville to St. Augustine. We travelled without the Cougar so I had reserved a hotel room for the weekend. I chose the Sleep Inn because of its proximity to the event site. The weather was great and the drive was easy. The last few miles were through the heart of St. Augustine. We have never been here before and we were quite taken with the downtown. 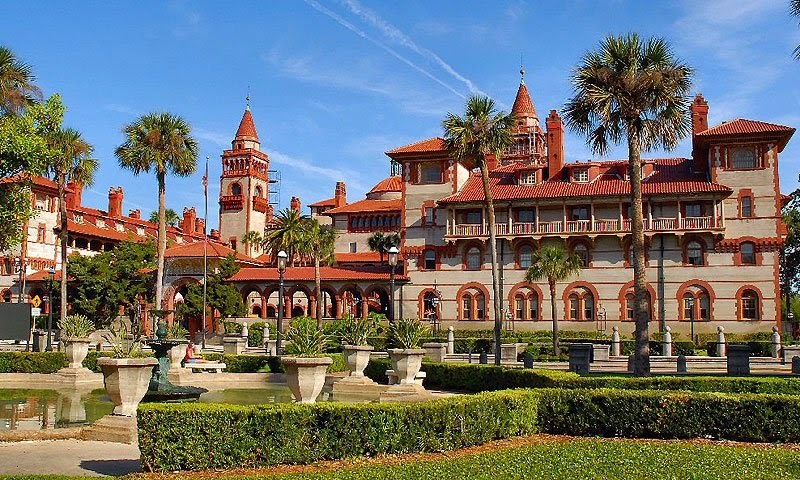 Flagler College dominates the cityscape with impressive buildings of Spanish architecture. The centerpiece of the campus is the former Hotel Ponce de León, a grand resort built in 1888 by Henry Flagler. This structure is an intricate complex of four buildings representing a mélange of historical styles. We arrived mid–afternoon, settled into the hotel, and got our stuff together for the Pre Dinner (AQ3245) event tonight. Keep in mind we have never been to one of these before and had no idea what to expect. I had read an article on event preparation but that was all I had to go on. 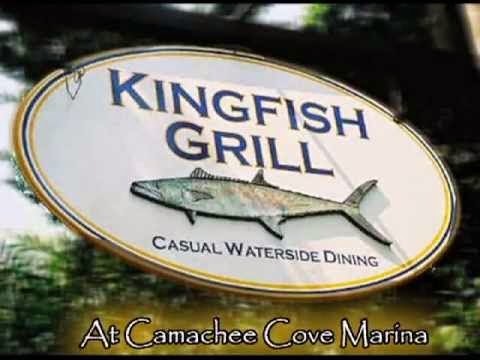 The dinner was held at the Kingfish Grill – a nice restaurant and bar on the waterfront in St Augustine. 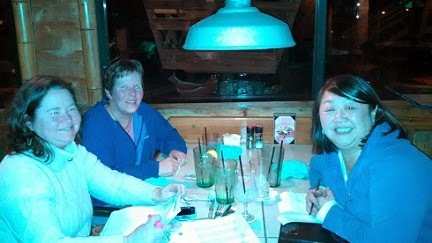 We were a large group so we had preselected menu choices and they had us on the outdoor deck. Later when I went inside to the restroom, I got a look at their Sushi Bar. Awesome – I'll have to get back there sometime. Eating out on the patio of a nice restaurant on a Florida evening sounds neat. And it probably is. But tonight was downright cold. We all were in heavy jackets, some in gloves, and it was a race to eat your meal before the food got cold. The main activity, of course, was "stamping in". That is where people exchange stamp images. Your signature stamp is the stamp you use whenever you stamp someone else's logbook. By the end of the weekend, I had collected many signature stamps. A lot of them are quite creative. The ones that have your handle built into the stamp save a lot of writing. Here are a few including mine. 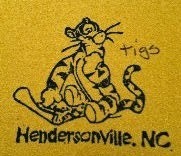 For many, the big part of this hobby is carving rubber stamps. So there were a lot of carved stamp collections and people were busy stamping as fast as they could to get as many stamps as possible. 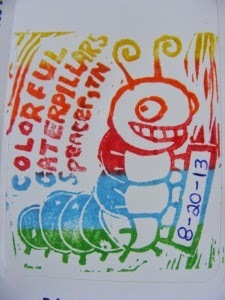 It was pretty overwhelming for us but everyone made us feel welcome and we quickly joined in the stamping frenzy. I'm sure our newness was apparent to all. We showed up with one stamp mounted on a wooden block and a cheap stamp pad, purchased from an office supply store, that was way too small for most of the stamps. Both of which are NoNo's. Stamps are not mounted. 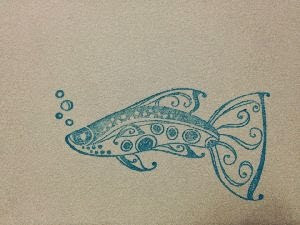 Stamp pads are always from an art supply store. 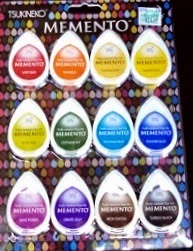 The ink is of much higher quality and the pads are configured so that you can ink a large stamp. Always something new to learn. 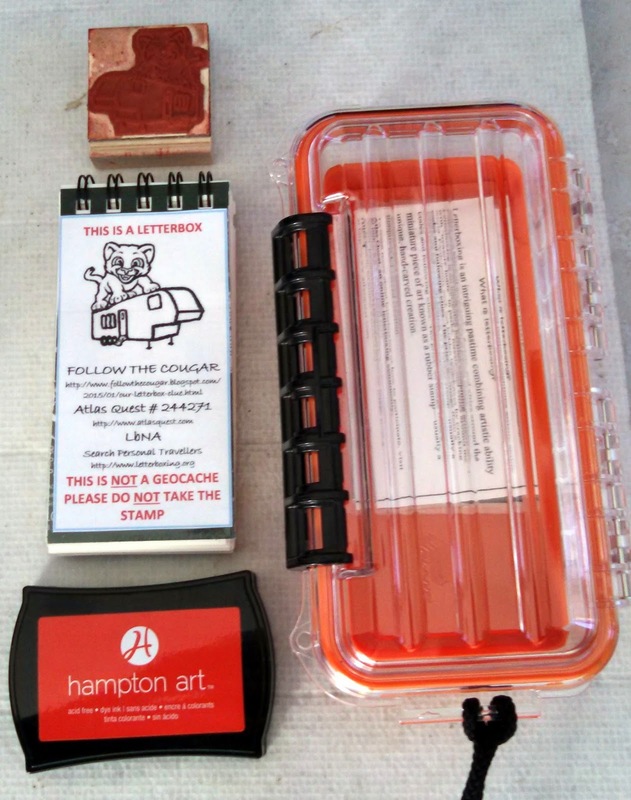 Based on my geocaching experience, I expected letterboxing to involve a 'box'. Not so far. 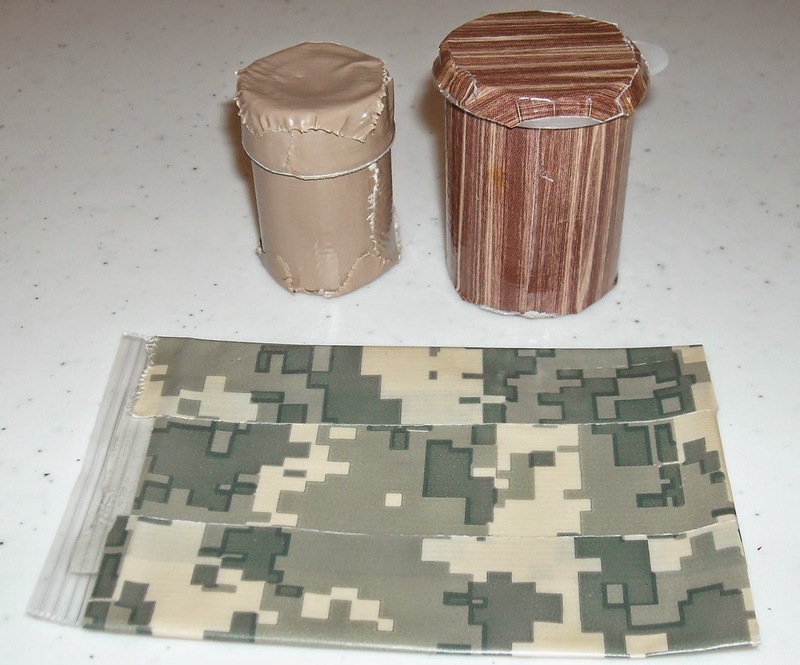 More likely it will be a sandwich size ziplock bag or possibly a film canister or pill bottle covered with camo duct tape. 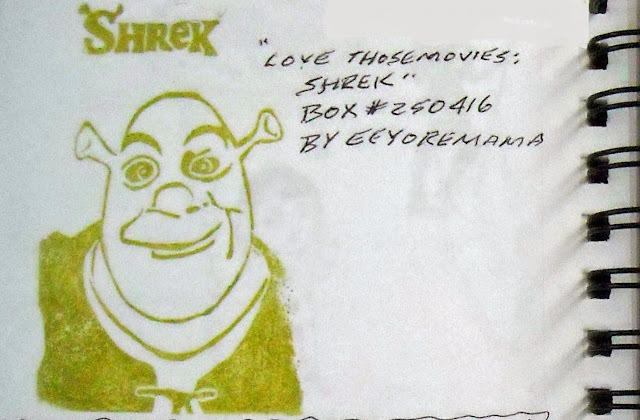 The theme for the whole of this three day event is "Love those Movies", so all the stamp trails have a movie twist. Our dinner event had one trail/series titled Love those Movies: Dinner Theater (13) (AQ Box#250444). There were thirteen stamps, all having to do with food and drink, hidden (not really) along a short path around the restaurant. Each stamp counts as a separate find. We found twelve. By 8PM we were tired, cold, and confused. Not hungry though; we had a good meal. It was time to head back to the hotel for some warmth and sleep. Tomorrow is another day. This morning we left our hotel (after our free breakfast) heading for the Windsurfing Pavilion in Anastasia State Park. It was less than half a mile – quick and easy. 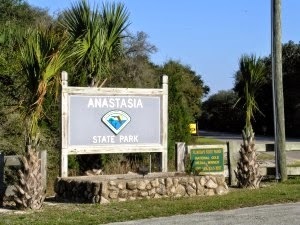 Anastasia State Park includes 1,600 acres of rich ecosystems and wildlife, four miles of pristine beach, an estuarine tidal marsh, a self-guided nature trail which takes you through the maritime hammock and onto ancient sand dunes, a campground with hookups, several group picnic areas, and an amphitheater. You can also visit the Coquina Quarry, an archaeological site. 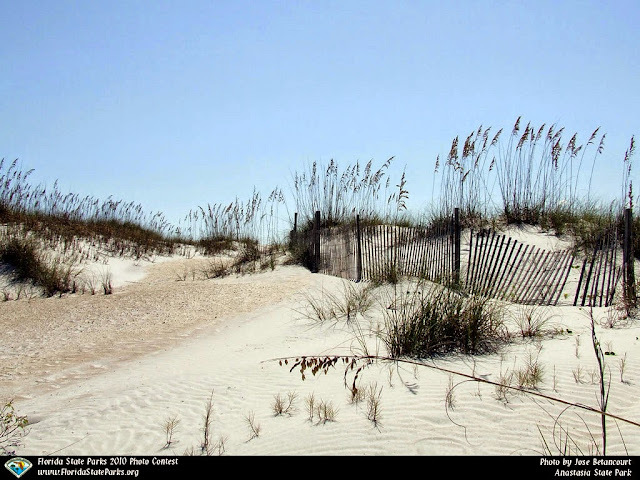 At Anastasia, there are many recreational activities to enjoy including hiking, swimming, beachcombing, bird watching. There is a beach snack bar and a rental facility for catamarans and kayaks. A few folks had arrived early and were busy trading stamps. 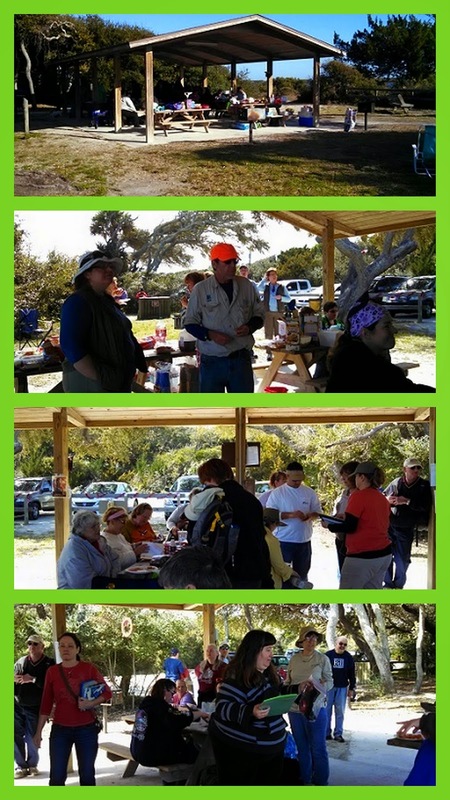 Two tables were designated as food tables for the pot luck lunch and were already loaded with goodies. After dropping our contribution to the pile of food, we joined the crowd. Boxes, usually event stamps, left at an event or gathering for people to discover and stamp into. Many times, the stamps are left on the top of a picnic table for anyone to pick up, but it refers to any type of stamp that's sitting around at a gathering available for the taking whether it's on a table, on the ground, in an ice chest, or anywhere else they may be cleverly hidden or disguised. I'm having a hard time with the use of the term "boxes". There were no boxes. Mostly just naked unidentified stamps – occasionally a zip lock baggie. Anyway, there were stamps everywhere, so we joined the game and "stamped in" everything we could. Our hostess eeyoremama had laid out a trail of twelve boxes (there I go again) based on the characters from Despicable Me. These were small stamps in camo baggies hung from the branches of bushes along a trail in the sand dunes of the park. Someone named this the Minion Trail. I could not find this listing anywhere but the name seems appropriate so I'll use it too. 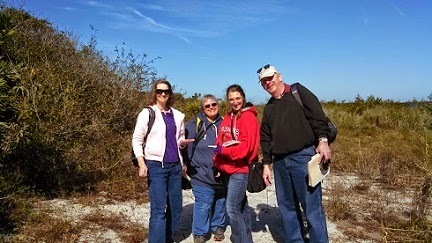 We had a pleasant walk along the trail through the dunes along with several other folks and found all twelve. As we walked the trail, we encountered people who wanted to exchange signature stamps. So we did. And here is where my lack of logbook organizing skills got me. I intended to have two facing logbook pages devoted to this collection of twelve stamps of minions. Exchanging sig stamps blew that idea. So my page display is twelve minions interspersed with four sig stamps. I'll get it together some day. Someone we spoke with told us "Don't even try". Can you pick out the six sig stamps on these two pages? Back to the pavilion for our pot–luck lunch. I have never been to a pot–luck meal that ran out of food. This was no exception. We all had plenty to overeat and left overs to take home for two more meals. It was all good. Then a raffle. That's when it hit me how much our hostesses had put into the event. There were a ton of prizes and none of them were cheap. 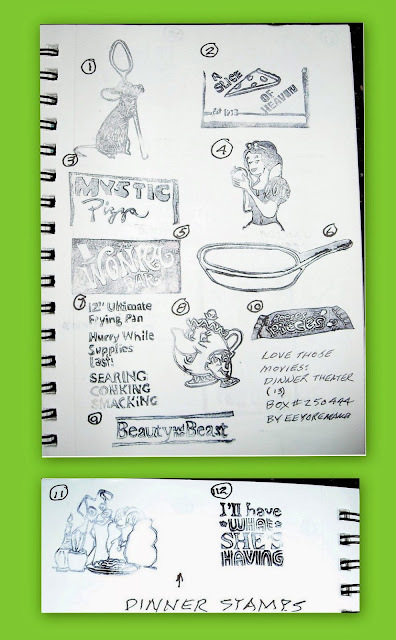 These were not gag gifts or trinkets but significant items with substantial price tags. So here I'll pause to give Lynda and Cindyellen a special thanks. Back to the hunt. Lynda had laid out two more series close to the pavilion and easy to find. 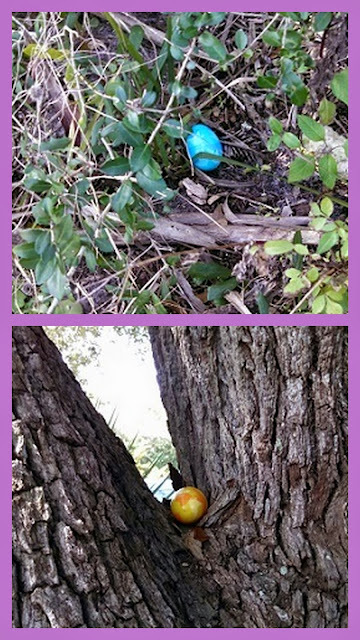 This was an easter egg hunt. Six yellow eggs contained Box #250455 Lights, Camera, Action and ten blue eggs contained Box #250454 Love Those Movies: Olafs. We found five of the six yellow eggs and all ten of the blue eggs. That was enough for today. For dinner we went to the Conch House on St. Augustine Inlet. 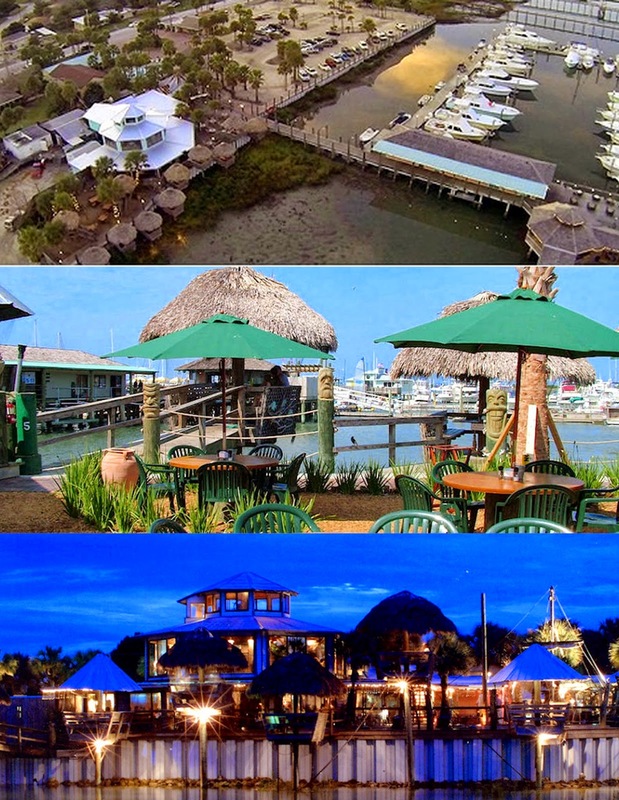 The Conch House is a marina resort offering casual dining, sport fishing, a lounge, and a motel. We picked the place on the word of the desk clerk at the hotel, and because it was close, and because we had coupons for free beer. It was a good choice. The food was good and the caribbean nautical ambiance was pleasant. There we ran into Rachluabster, Colorful Caterpillars, and scouttrekkie having dinner. We traded a few stories about the day, then they headed out for the night boxing adventure. We had dinner: Michelle fried oysters and I fried shrimp. Back at the hotel, I tried to log the day's activity at the AQ website. I succeeded somewhat and learned a lot about navigating the website and even more about organizing and controlling my logbook. I probably could have done more had I been able to stay awake. Busy day plus full tummy equals sleepy old man. Nite all. After our free breakfast at the hotel and fortified by coffee and donuts at the pavilion, we were ready to tackle more letterboxing challenges. The crowd was much smaller this morning. Some slept in, others were gone. 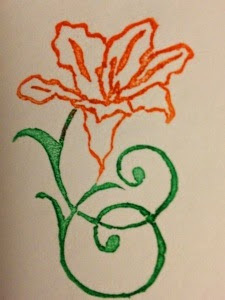 We sat around for awhile; talking and stamping. We finally got rolling with an easy find. Good old Shrek was on the beach near the pavilion, so we scooped him up. Someone started collecting pictures of the art work on the sides of U-Haul vehicles. That became a collection of 38 (so far) letterboxing stamps. DS brought this to the event. We captured five representing states in which we have history. I wonder how many pages would be required to stamp all 38? One of the many contributions of our hostess eeyoremama was this box of five stamps of Totem Pole art. If you found this box, you would have to answer the question "Name the town in the Pacific Northwest that has a Anthropology Museum featuring totem poles." Since this was an event and she was very busy, we didn't have to do that. Sorry I stamped the whale upside down. We had time to do one more trail. We chose to do Box#250435 Love Those Movies: Cartoons (12). This collection was located on a trail along the perimeter of the park and began in the campground. Since we wanted to check out the campground for future use, this seemed to be a good idea. This box had stamps from the films Jungle Book by RiverKat and Madagascar by eeyoremama. We found all twelve. Several people have told us that St. Augustine has beautiful Christmas light displays. 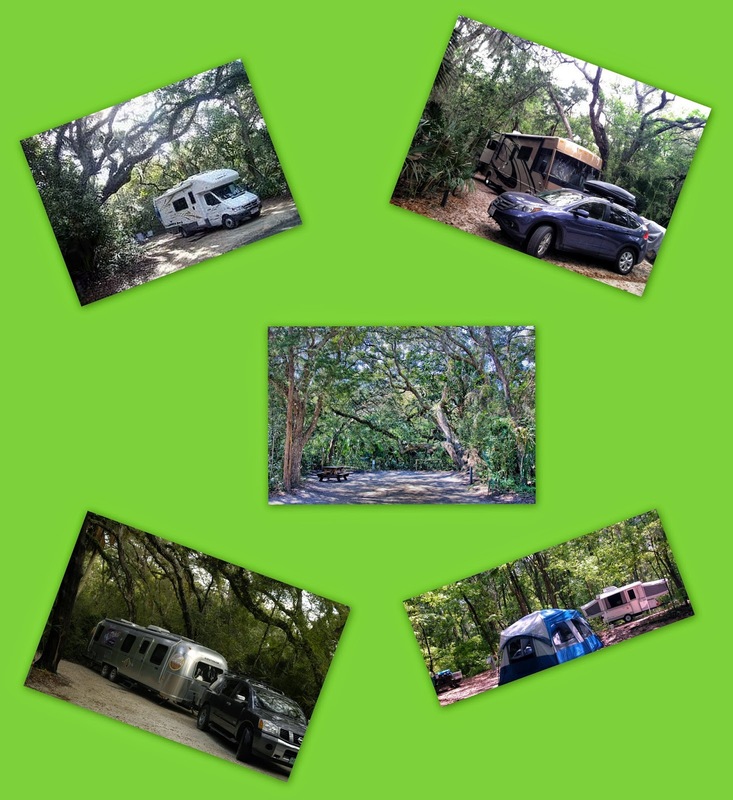 Neighbors of ours come to see the displays and camp in their RV here in Anastasia State Park. That sounds like fun so we wanted to checkout the campground for future use. 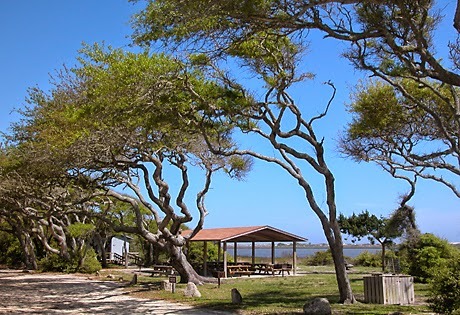 The campground has 139 campsites all located within the beautiful maritime hammock just a short walk or bike ride from the beach. Our box was with us for the whole weekend. Only three people stamped in. I suspect people did not recognize it as a letterbox because it is a real box. I made it to be waterproof and withstand the elements. My geocaching experience told me that most containers leak or fall apart after a short time. I guess I overkilled it. I do that frequently. You can see our clue here. There were a lot of people coming and going all weekend. Since we were the newbies, we really didn't know anyone. We met and exchanged stamps with many but I know it was less than half of the population. Here are the folks we met. By the time the event ended, I was super impressed with the size of the job Lynda and Cindyellen had pulled off. The amount of work was obvious to anyone who has arranged and executed an event of any kind. They had no sponsors so I could see there were big bucks out of their pocket. 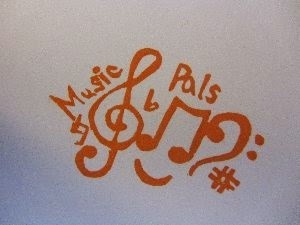 I appreciate it and I hope others recognized and appreciate both the time and treasure that went into the weekend. 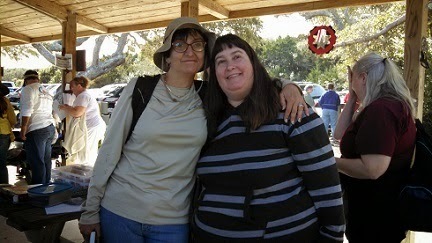 Cindyellen and her husband have recently become full time RVers and WorKampers. That is the world I live in. We are in our fourth year and love it. Next summer they head to Vermont for their first job working in a campground. The mountains of Vermont are beautiful. I hope they have a great experience. I'll share some blog posts of our experiences with them. We are doing a 7,000 mile big circle that includes New Mexico, Colorado, Idaho, North Dakota, and Delaware. I'm getting "Hitch Itch" thinking about it. I welcome comments to this blog post – especially pointing out errors. I'll fix errors and include omissions if I can.